Exposure to heavy metals is impossible to escape from in this day and age. Exhaust from fumes, plastics, kitchen utensils, fish and even the air we breathe all contain heavy metal, such as lead, mercury, cadmium, aluminum and more. Once accumulated, heavy metals can cause behavioral, mental and physical disorders. Children are especially vulnerable to the effects of heavy metals because of their delicate systems. It can cause learning disabilities, stunted growth, behavioral problems (restlesssness, short attention span) and impaired hearing. In adults, heavy metals can cause cardiovascular disease, neurological disorders (dizziness, tremors, inability to focus), and sexual dysfunction. It binds with lead, mercury, cadmium, aluminum, arsenic and many more heavy metals. It safely removes heavy metals through two routes: the kidneys and gastrointestinal tract. In this way, it puts much less burden on the kidneys than conventional chelation. It does not strip away essential minerals so there is no need for mineral supplementation during or after chelation. It has been shown recover liver function from damage caused by heavy metals. It is safe for children 3 years and older. Heavy metals can deposit in the bones, fat, muscles and tissues over time. 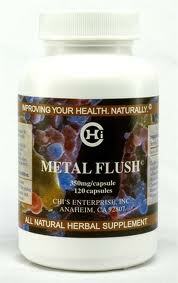 With Metal Flush, heavy metals in the bloodstream are continually removed. Eventually, metals that have deposited in the bones and tissues are released into the bloodstream to create equilibrium. This makes the heavy metals more accessible to Metal Flush for chelation. Call (949)954-6226 to order your Metal Flush today! Does metal flush detoxify plastic?